We were driving back into the city today after a weekend away and I thought, what makes San Francisco unique? Is it the foggy weather? Or that bedazzled Coca-Cola sign along the highway that’s been there forever? Is it an event like Litquake or Bay to Breakers? Or a sports team like the Giants or the 49ers? What about the sites like Golden Gate Bridge, the De Young Museum, or Coit Tower? Maybe it’s my favorite tourist attraction and my mode of transportation–the cable car! 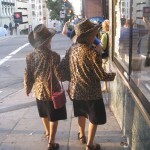 Then I see the look-a-like, dress-a-like twins. I happened to have my camera with me and snapped this picture of them as they walked in front of me. They actually peeped into Uncle Vito’s pizzeria, perhaps for a slice or two? People around me took notice and pointed, “Oooh look at those ladies.” Yup, add them to the list because this special duo makes San Francisco one of a kind.